An artist’s rendering of the Boston Landing station in Brighton, scheduled to open in 2016. The Brighton commuter rail station funded by New Balance is one step closer to finally opening, after Governor Charlie Baker and Transportation Secretary Stephanie Pollack joined New Balance leaders for a groundbreaking ceremony on Tuesday. Pollack lauded the public-private partnership that will create a new stop called Boston Landing along the Worcester-Framingham line near New Balance’s headquarters. In a unique partnership with the MBTA, New Balance will pay for the new $20 million station. Officials originally said the station would open in 2014, but it is now set to open in the fall of 2016. It will be located next to New Balance’s $500 million development, which also includes the Boston Bruins’ new practice arena. Jim Davis, the chairman of the apparel and shoe company, called the station a community effort. 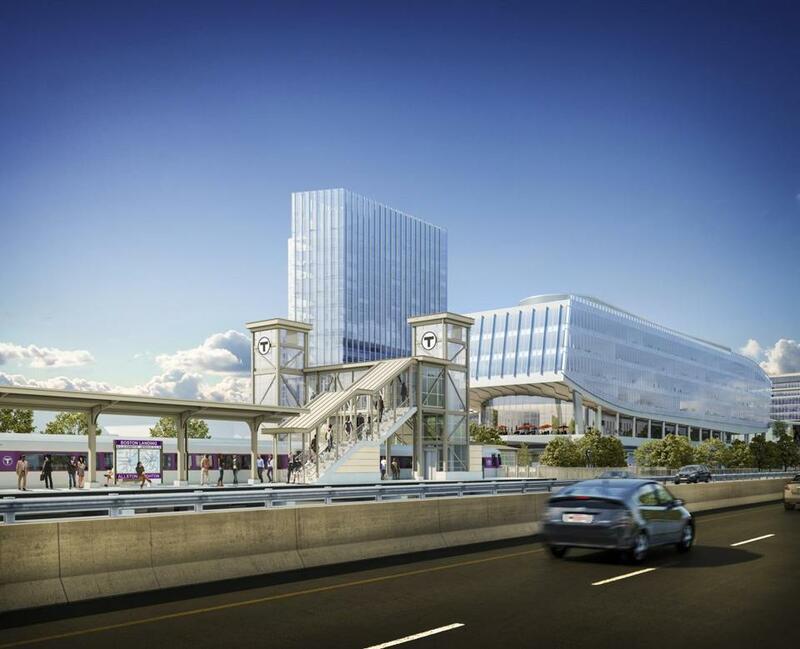 The move brings commuter rail back to Brighton more than five decades after three Allston-Brighton stations were closed to make way for the Massachusetts Turnpike. MBTA officials also hope the station can one day be a stop along a transit line for “diesel-multiple units.” Such self-propelled cars use commuter rail tracks, but run much more frequently than commuter rail trains. Anabela Gomes, of the Brighton-Allston Improvement Association, said the station will give its residents more crucial transit options. The Green Line’s B branch serves the area, but the line is often slow and congested. Baker has taken deliberate steps to control the MBTA, after a series of snowstorms devastated the transit system. In April, he introduced legislation to overhaul the agency, though Senate leaders dealt a blow to the plan by rejecting much of it in its budget released on Tuesday. Baker said he believes the initial rejection from the Senate is just one step in a longer legislative process. Despite the setback, Baker now has complete control of the board that oversees the T. After he pressured six Massachusetts Department of Transportation board members to step down, he appointed five new members to join Pollack on the board last week. On Tuesday, Baker appointed Robert Moylan Jr., a former Worcester official, to the last vacancy on the board. Moylan served 21 years as the commissioner of the department of public works and parks for the city. Baker also designated Ruth Bonsignore, a longtime transportation consultant, as chairwoman of the board on Tuesday. The new board will have its first meeting on Wednesday, starting at 1 p.m. at the state transportation department’s headquarters at 10 Park Plaza.